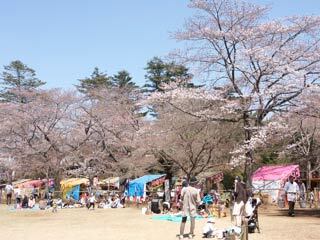 Shimizu Park (清水公園) is one of 100 best Sakura spots. It is located in Noda, Chiba prefecture. There are about 2,000 Sakura in This park. From the end of March to the beginning of April, all Sakura bloom and people around this place have Hanami party at this park. During the Sakura Season, there is Sakura Festival and beautiful light-up Sakura at Night. There are many facilities in this park. Especially, the Athletic Field for Kids is very popular. Labyrinths in this park are very popular, too. Also, there are a stable for horse riding, a pond for fishing and boat riding, a camping & BBQ space and flower garden. Reservation required for Camping and BBQ. Tsutsuji Flower in this park is one of the most Tsutsuji spot in Kanto Region.